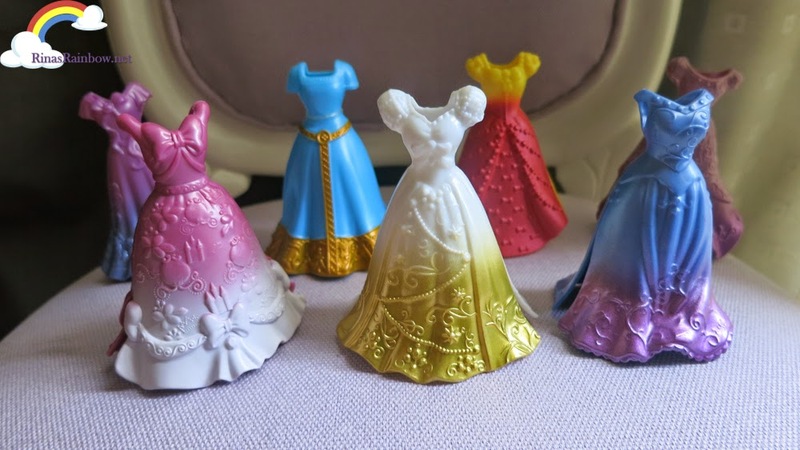 Rina's Rainbow: Disney Princess Clip-On Dresses! 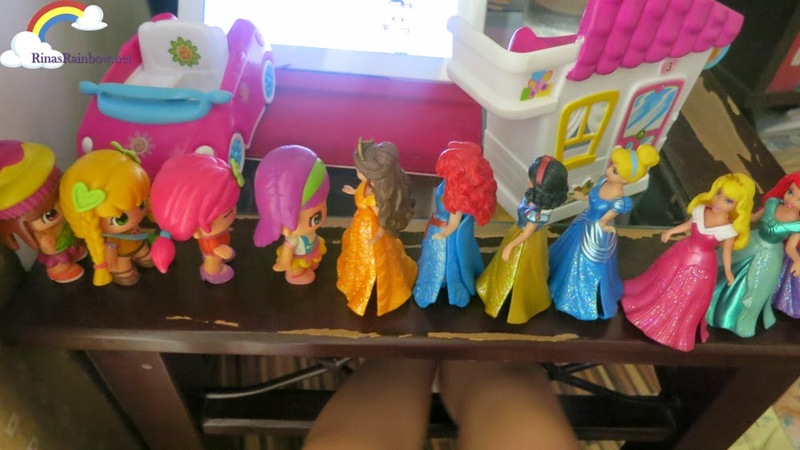 I've been seeing this toy in YouTube for quite some time now, because Rain keeps landing on them when she watches her favorite kiddie videos in YouTube (Disclaimer, with my supervision! I'm being defensive haha!). 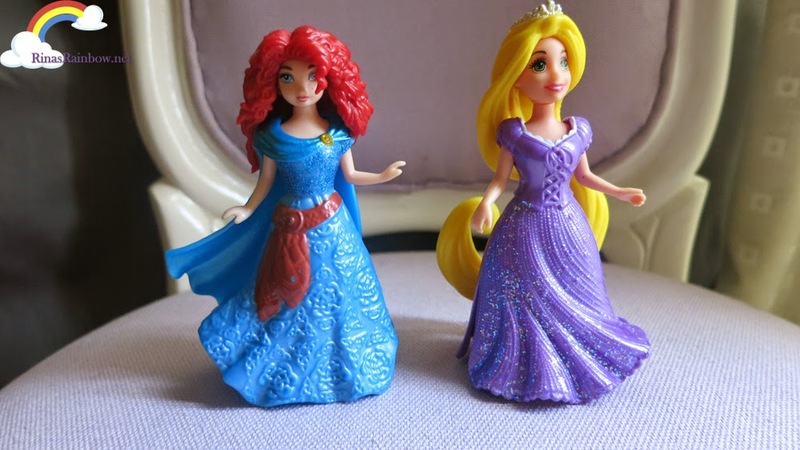 Anyway, since my little Rainbow is fond of playing with little dolls wherein she can alter them in some way, I thought she would really love these Disney Princess Clip On Dresses! So back in June, when Richie asked me what toy he should get for Rain while he was in the states, this was on the top of my list! 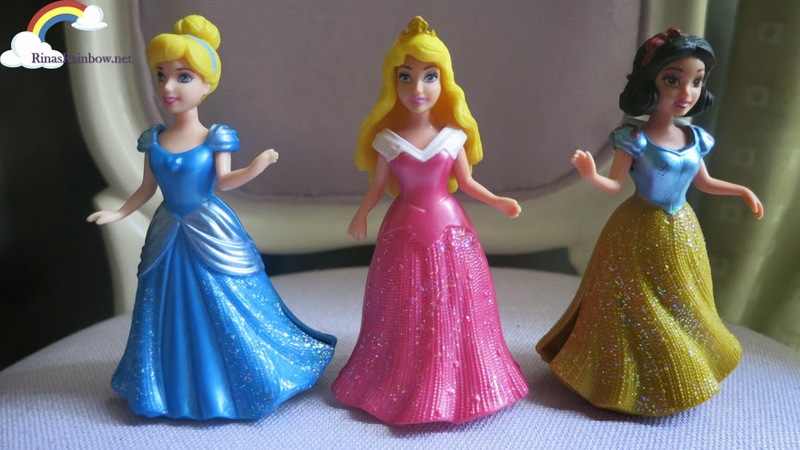 Each Disney Princess comes with an extra clip-on dress. 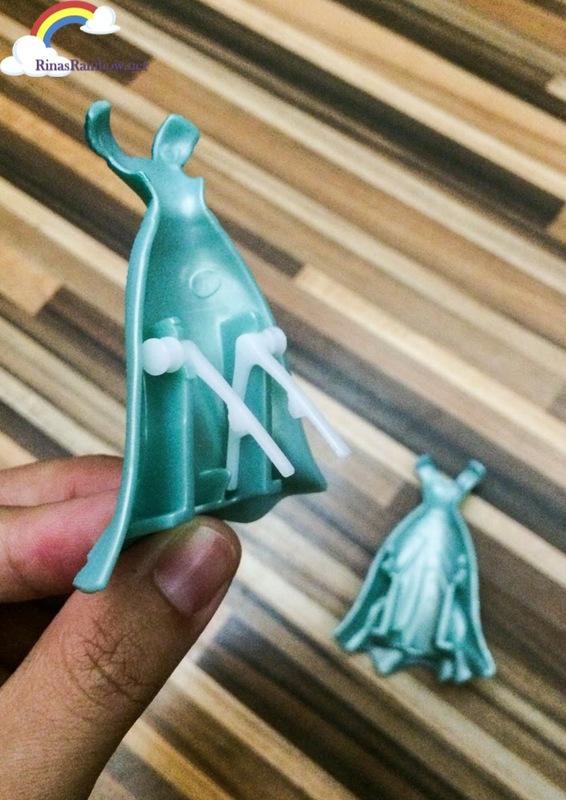 Just squeeze the bottom of the dress to put or remove them. I love that there are no metal spring parts anywhere in this toy. Instead they used a plastic bracket thingy to force the clip back shut. This means Rain can play with it in the bathtub as well, and nothing will rust. If in case someone accidentally dismantles them, it's easy to clip them back on. 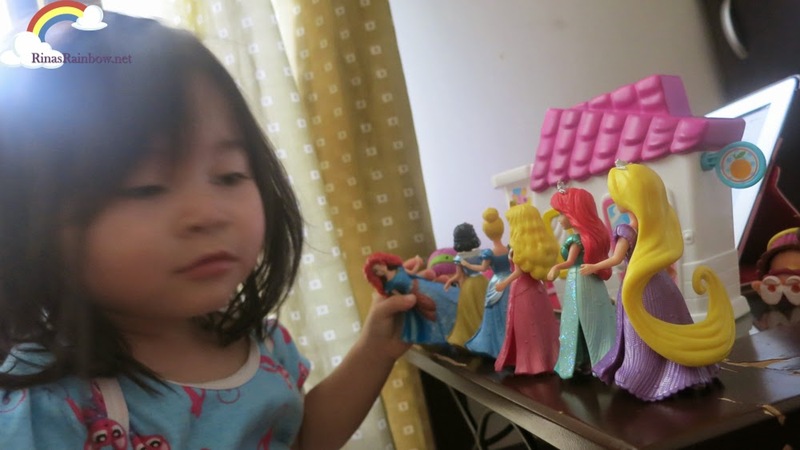 She loved them so much she asked us to open them right away! 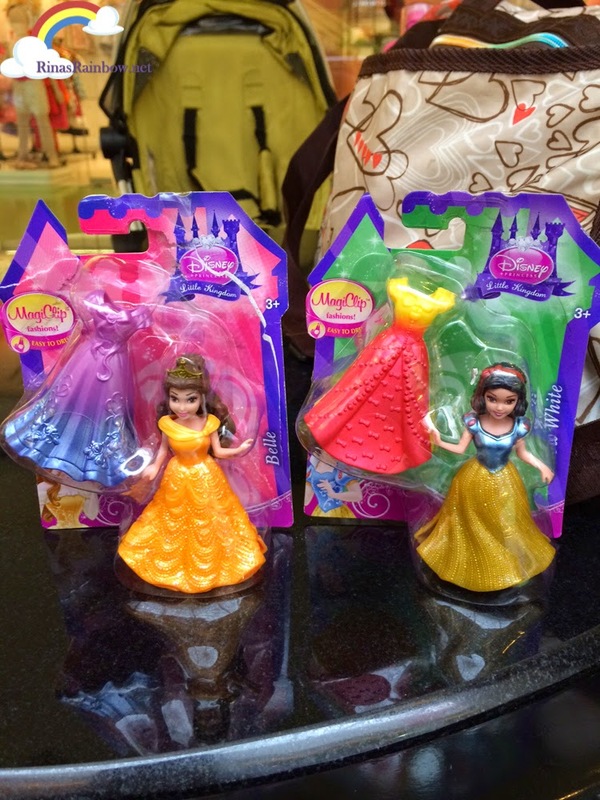 Soon, when we were at a toy store in Eastwood Mall, We saw these! 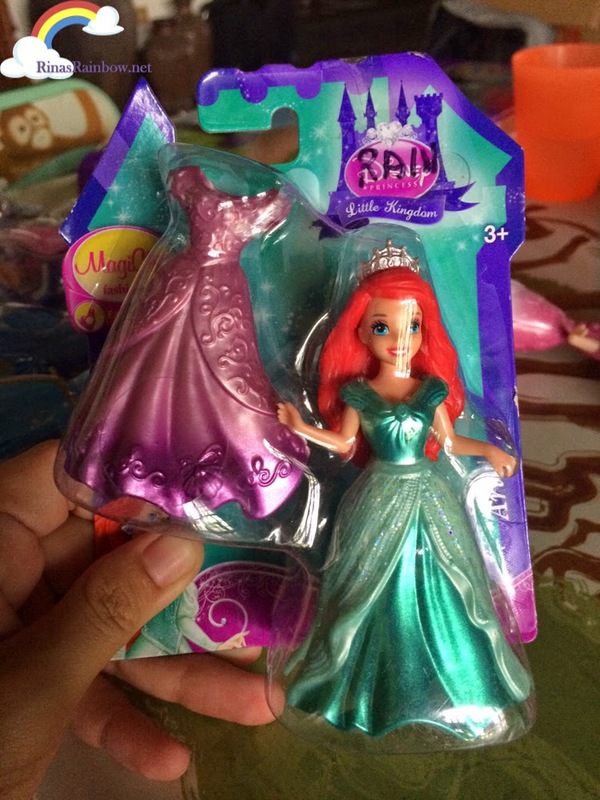 Two princesses that Rain didn't have yet. Belle and Snow White. 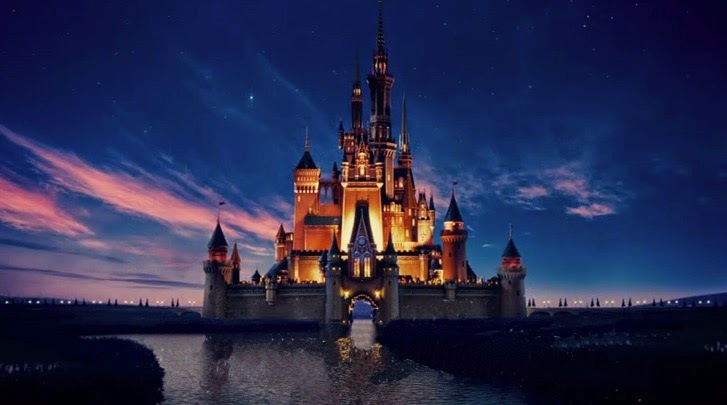 So now we just need Elsa, Anna of Frozen, and Tiana from The Princess and the Frog. 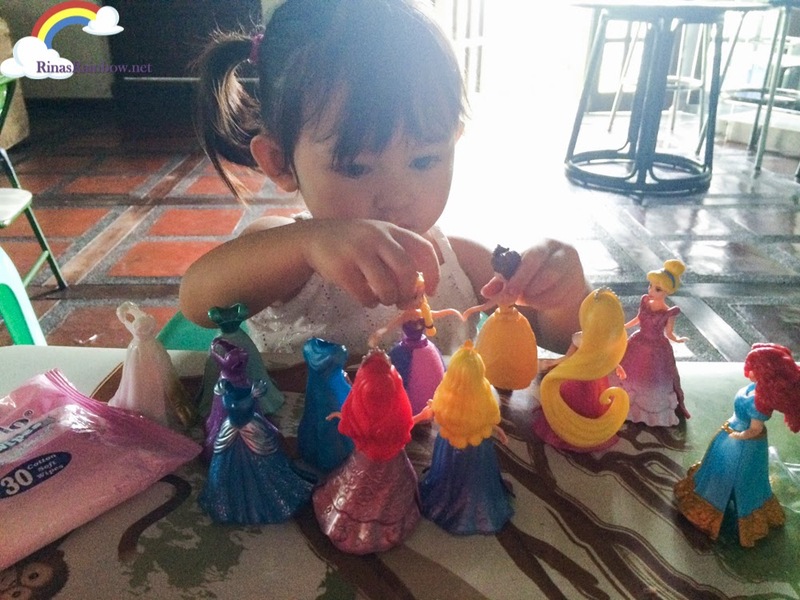 She loves playing with it together with her PinyPons. 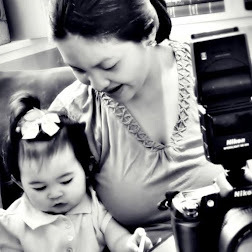 She makes up skits in her own toddler language haha! 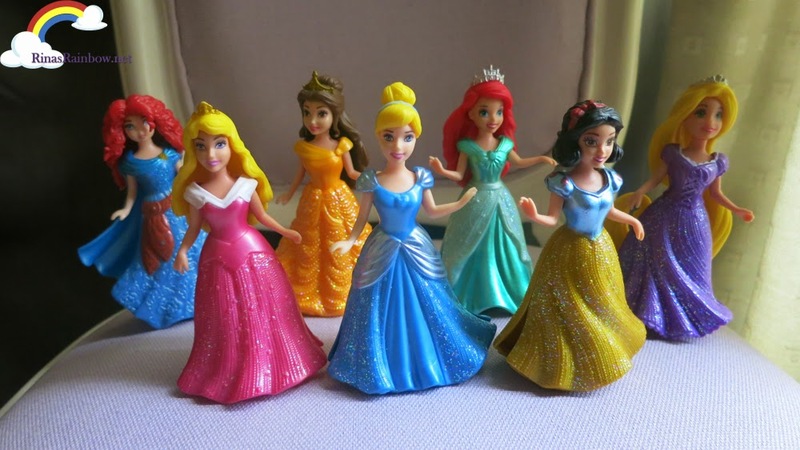 PinyPon and Disney Princess Dance-off? 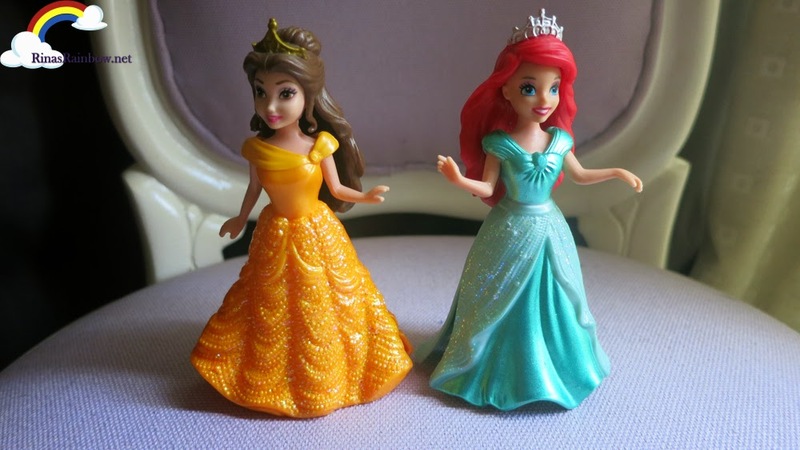 The next generation Disney Princesses, Belle and Ariel. 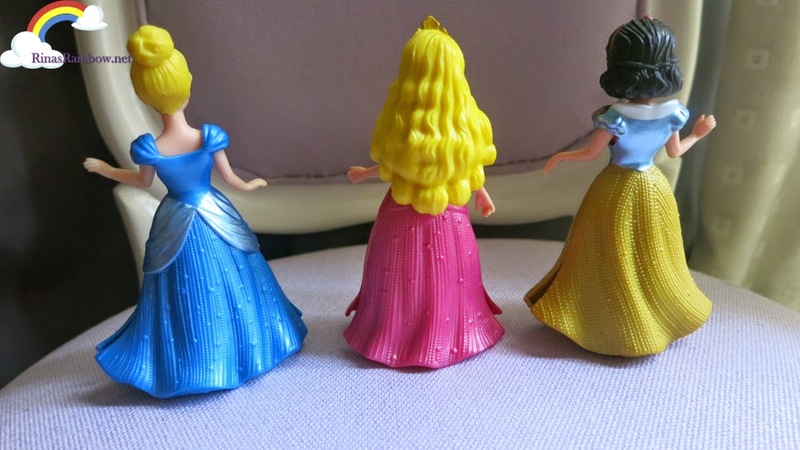 Jasmine is missing. 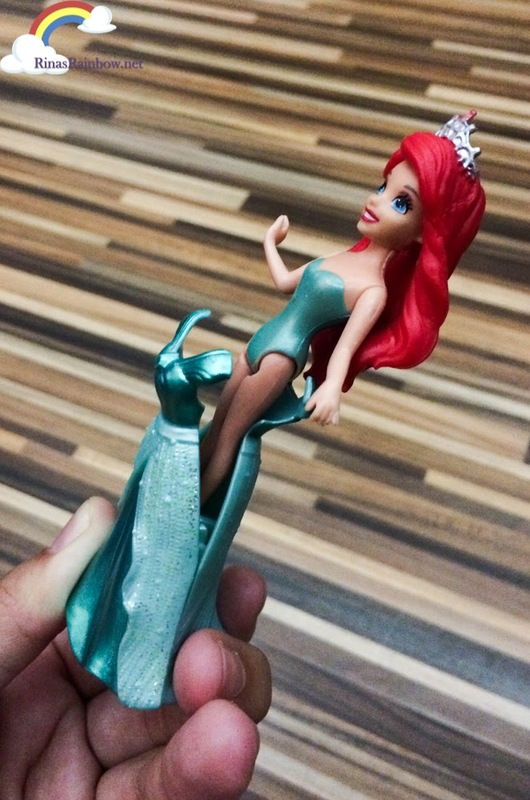 I haven't seen any Jasmine version anywhere even in YouTube. Maybe because she wears pants? 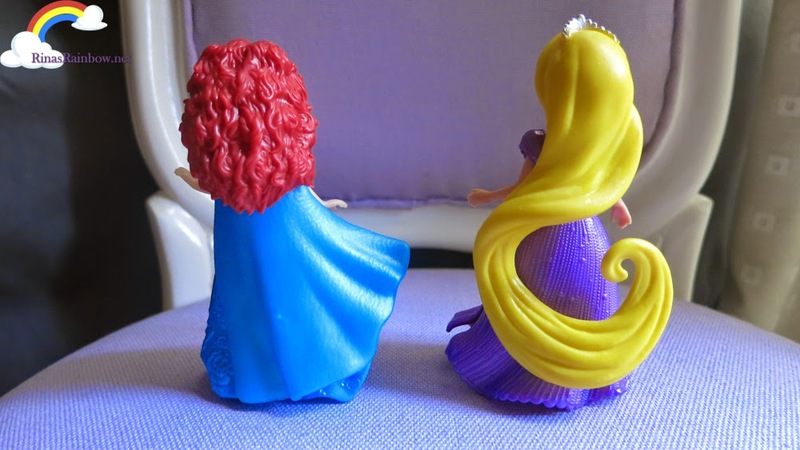 And then the 3D animation generation of Disney Princesses, Merida and Rapunzel! Back shot. 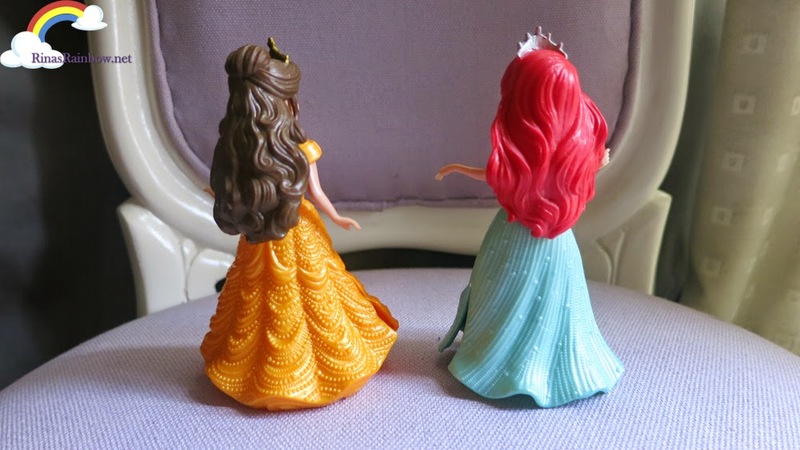 Love Rapunzel's swirly and wavy long hair! 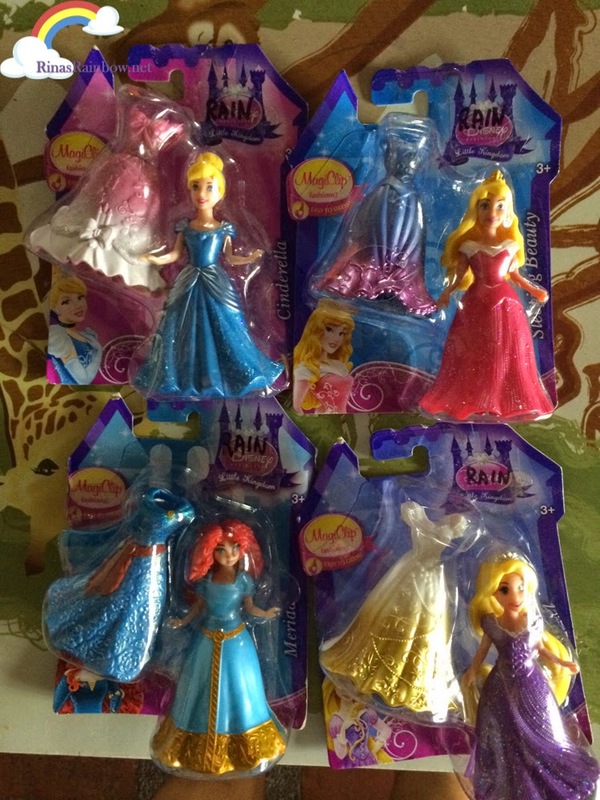 Mom also got Rain these floating princesses. 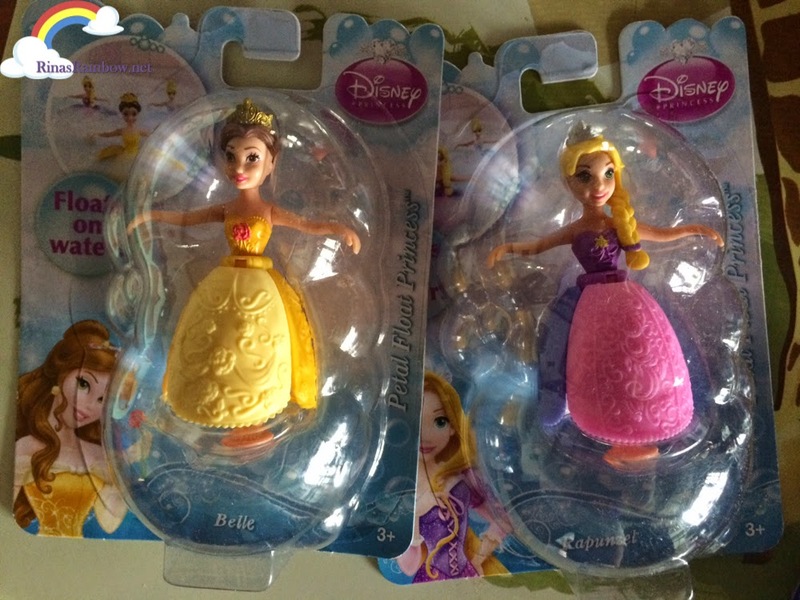 Belle and Rapunzel. Their gowns are made of three flaps with foams under each flat, that open up and serve as their floaters. More on these on another post maybe.